The publication of ten-year-long (1992-2002) correspondence be­tween Oksana Zabuzhko and Geor­ge Shevelov was one of the major book events last year. 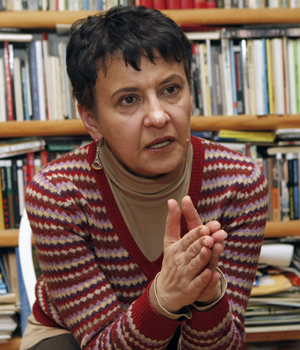 As for our news­paper, one of this year’s intellectual events was the discussion of George She­ve­lov’s article “Moscow, Ma­rosei­ka” (written in 1954 in Boston) which The Day printed in English translation on De­cem­ber 29, 2011. Oksana Za­buzh­ko is convinced, incidentally, that this article should be part of the school curriculum. It is about the question of being able to appreciate Your Own and Reasonable, as well as about knowing how to read, after all. The writer said that George Shevelov’s study-room library is now in Japan. He willed his book treasure to Hokkaido University under the guarantee that the library will not be disbanded. 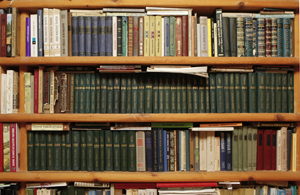 Shevelov’s books are one of the world’s largest private Slavic book collections. It would have obviously taken a special meeting to speak with Zabuzhko about Shevelov, but we found an occasion to communicate with the writer – it was Den’s action “Sandarmokh List” and the topic of overcoming the totalitarian legacy. Actually, Den also had other questions to Ms. Zabuzhko. Do you think Ukrainian literature has coped with this in the past two decades? “Ukrainian literature has had somewhat different tasks in the past two decades – it had first to learn to survive in market conditions and it has successfully proved its viability in this field. What sets the most ‘long-term programs’ to the nation is not modern literature (it will only show its effectiveness in the course of time) but classic literature which is in dire straits now – nobody just knows it! In general, it is one of our greatest dramas (I am fed up with saying this for so many years) that we have failed to bring back our cultural heritage over the 20 years of what we call independence. “The Ukrainians are being reproached today for ‘forgetting how to read.’ But have they really known how to do this before? Not in the least, the notorious Soviet ‘culture of reading’ was based on the fact that it was parti­cularly nothing else to do that country. Books were cheap and easily accessible, while there were acute shortages of the other benefits of life. The book was in fact a diversion from a life that consisted for the vast majority of Soviet citizens of monotonous daily rituals, an ‘improved-type prison’ of sorts. The only way out was to read and live somebody else’s life. The collapse of the Soviet system opened innumerable other, previously inaccessible, opportunities and, accordingly, threw away that ‘involuntary reader.’ So I am personally not inclined to mourn over this loss. What long-term “programs” does Ukrainian literature offer? Obviously, somebody is to blame for the fact that the nation does not know what it should be proud of even 20 years on – for example, journalists who have wallowed in political mud instead of getting back to Lysiak-Rudnytsky. Why do you think the Ukrainians have not restored their cultural heritage? And they are perhaps arousing hope that restoration is possible. What do you think the program of overcoming the totalitarian legacy should consist of? You recently said in a Radio Liberty program that the 75th anniversary of mass-scale executions of the Ukrainian intelligentsia in Sandarmokh one of the chief events in 2012. And Den proclaimed 2012 as Sandarmokh List Year. Why do you think Sandarmokh is important today? “It is very good that you have been highlighting this subject since the past year. Constant dripping wears away the stone. Well, from the very beginning. “1937 was the year when ‘the revolution began to devour its children,’ or, to be more exact, when one mafia had ousted another. To meet the targets dictated from above, the Ukrainian communist-party and industrial elite was also to be slaughtered. It is worthwhile recall Naum Korzhavin (incidentally, he was born in Ukraine) who was the first to say that in Ukraine ‘1937’ in fact began earlier, in 1934, immediately after the end of the Stalinist collectivization. In general, the early 1930s in Ukraine were notorious for the genocide (‘stratocide’) of not only peasants but also the intelligentsia. The latter was being exterminated in several stages. The first stage was 1930, the so-called SVU (Ukraine Li­beration League) trial which affected the ‘old,’ pre-Revolutionary intelligentsia of the nobility and ‘Petliuraites,’ what may be figuratively called ‘Lesia Ukrainka milieu.’ The SVU trial resulted in 30,000 prisoners in 1930 (according to Gely Snegiriov) – in fact the entire stratum of the ‘old’ elite. They were bearers of the cultural memory which we have been unable to put together since then. This resembles the cut-up Cossack in a fairy tale, who was first to drink some water of death in order to collect all his limbs and then to drink some water of life in order to rise. The second stage was the 1933-34 ‘harvest,’ starting with the suicide of Khvylovy and Skrypnyk: this time the ‘new,’ post-Revolutionary, intelligentsia, the se-called Executed Re­naissance, were first thrown into basements of the October Palace, the NKVD headquarters, and then shot by firing squad. This generation was not homogeneous inside, the ample proof of which being heated debates in the 1920s. There were ‘left-wingers’ and ‘right-wingers’ among them, those who sincerely believed in a ‘worldwide revolution,’ in that the world will soon be a ‘union of free republics’ – after all, Ukrainian social democracy had longtime traditions (the superb translation of Internationale by Mykola Vorony is not ‘contract stuff’ but a product of sincere inspiration). What rallied them together was the belief that the Ukrainian SSR was an independent, albeit communist, republic, ‘a state of their own’ for which they worked. Sta­lin showed this first generation of Soviet Ukraine’s elite who was really the boss. “As for 1937, I do not think I should dwell on Soviet power: it is enough to say that, to celebrate the 20th anniversary of the ‘Great October Socialist Revolution,’ 1,111 people were killed in five days – just like mass-scale human sacrificing ‘in honor of the holiday,’ like in cults of the Incas and Mayas. In this way, Captain Matveyev personally shot 1,111 people with a pistol in back of their heads. If we only knew what kind of people they were and how better humankind would be if they had not laid their heads in the tract of Sandarmokh but continued to think and speak! You know, this must never be forgotten: a certain Captain Matveyev was able to instantly foil the development of humanity and caused it such an ‘internal fracture’ that it will take decades, if not centuries, to heal it. “There is another important thing in the Sandarmokh List. There were over 200 Ukrainians there, with a more or less proportional representation of those who came from the west and the east. In other words, it was a consolidated list. The latter comprised the most fervent part of West Ukrainian intellectuals – those who had come to Greater Ukraine, attracted by the nationwide-scale cultural construction in the 1920s, which the provincial Galicia lacked. Incidentally, this is the reason why Kurbas found himself in Kharkiv. All today’s babble about a ‘split of Ukraine’ is an attempt to step over the blood they shed. If Sandarmokh were as deep-seated in the minds of Ukrainians as, for example, Katyn is in the minds of the Polish, nobody’s tongue would ever turn to make any se­paratist calls. “Captain Matveyev is perhaps the most representative symbol of killing the spirit. Clearly, this ‘captain’ can have thousands of names – German, Russian, Ukrainian, Chinese, etc. ‘Captain Matveyev’ is an armed man with a license to shoot. The earth has been and will be producing them. The question is different: how can we not miss the turning point in history, after which the heads of geniuses will be kept at Captain Matveyev’s gun point? “I do not exaggerate when I say ‘geniuses.’ There are at least four of them on the Ukrainian Sandarmokh List. It is Kurbas, one of the most acclaimed reformers of Ukrainian theater. There have been just a few theater producers of this class in modern history. Another figure of genius is a still underestimated and under-read Mykola Kulish. It is also Mykola Zerov, a genius of translation, transmission, intermediacy between cultures. And, finally, a prose writer for whom I will personally never forgive the Soviet power and whom it owes to me personally – it is Valerian Pidmohylny. He was arrested at 34. For a prose writer, it is ‘the age of a debutante.’ Young Pidmohylny’s novels can be called a precursor of existentialism – two decades before Camus, and I perso­nally, as a prose writer, was robbed of all the novels the mature Pidmohylny, in his 40s, 50s, and 60s, might have written: in my green years I learned the technique of psychological prose from the French, not from him. “In general, if we take the literature of the 1920s Ukraine, our, figuratively speaking, ‘Weimar Republic,’ I would say it clearly displays proto-existentialism. And Kulish is a precursor of the theater of the absurd: the cruel truths about man, which Western Europe discovered during World War II, were revealed for Ukraine a generation before, after the 1918-20 bloodbath. And the culture of the Executed Renaissance, in all its varieties and genres, promised to make such a contribution to humankind’s treasury that the loss of which cannot be compensated for. Believe me I am not saying this out of the patriotic propensity to exaggerate Ukrainian achievements: I am, so to speak, a nationally critical person. But in this case there are ample grounds for national pride and a scorching pain for the fact that all this was foiled or even physically destroyed, as, for example, works of the Boichukists. One of the leading British art researchers told me almost with tears in his eyes that after an exhibit of the Boichukists’ works or, to be more exact, of what was left of them, at the Metropolitan Museum of Arts he and his wife could not sleep for a month and had to be treated for a nervous breakdown. I can imagine what a shock it was for him to discover that some ‘Captain Matveyev’ should have eliminated a whole direction in the world monumental art in the 1930s. For he, as an expert, immediately recalls later monumentalists, such as Siqueiros and Rivera, and here he suddenly sees ‘destroyed’ under every sketch. For an inhabitant of Britain, where nothing has even been lost and there have been no wars and fires, the history of the Ukrainian avant-garde is almost the same as the history of the burning of the Alexandria Lib­rary. Conversely, we are living in a customary and never-ending Ruin.